Palak Paneer is a quintessential Indian dish, a favorite across the length and breadth of India. Made using Paneer (Indian Cottage Cheese) and spinach puree, this dish a delight to eat with any Indian bread. Here is how to make Palak Paneer recipe. Palak Paneer is a quintessential Indian dish, a favorite across the length and breadth of India. Although originally from the North, this leafy green, mildly spiced spinach and cottage cheese gravy has its own variations in different states. The curry with all the goodness from Spinach and Paneer is super quick to make as well. Try to make the most of your time by blanching the spinach on one stove and meanwhile it’s getting done, make the masala base for the curry and you have a delicious dish ready under 30 minutes. 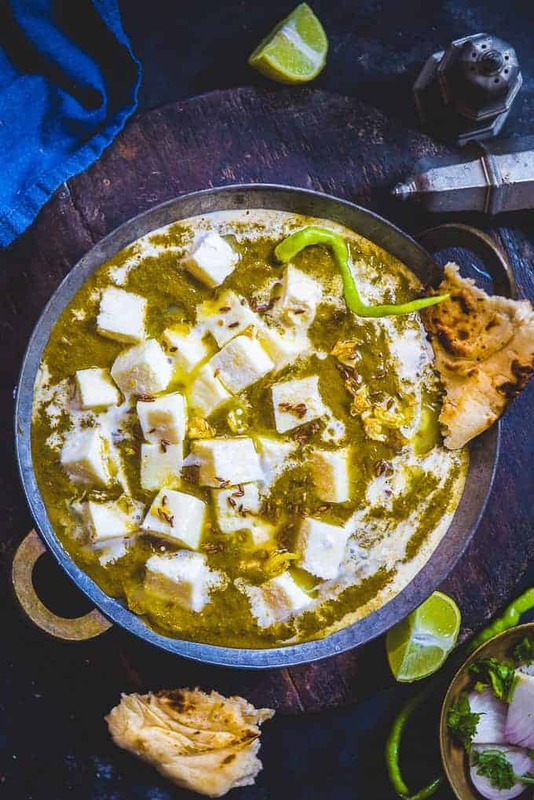 This recipe of Palak Paneer is just like the one that you get in your favourite indian Restaurants. The bright green colour of the spinach can be achieved by adding a small amount of baking soda in the water while blanching the spinach and making sure you do not over cook the spinach after adding it in the curry. The smoky effect that you get in Restaurant style curries is from the Dhungar method where a burning piece of coal which is kept on the curry is poured with some ghee on top and the smoke that releases is trapped in the curry. Do try this method and I am sure you will love it. I also make a No Onion and Garlic version of this recipe which I will post soon. 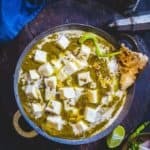 To cook palak paneer recipe restaurant style, palak or spinach is first blanched in boiling water and it is then cooked with spices and paneer is added to it. I love this version of palak recipe more than others and so this Indian palak paneer recipe is a regular at my house. I make palak paneer very often, either to go with rice, laccha paratha, Pooris or Makki Ki Rotis. Palak is very nutritious and together with paneer takes care of calcium, iron and protein levels of the body. These two main ingredients are also used in making several other tasty dishes. Here is how to make Best Palak Paneer recipe. You will need palak or spinach to make this dish. Try to use fresh and small leaves. The quality of palak makes a lot of difference in taste of palak paneer. Use good quality paneer to make Palak Paneer. You can get paneer in any Indian stores. Infact, a lot of regular grocery stores in US also carry paneer these days. I like to make my paneer at home using organic milk. It’s a very easy process and with some pre planning, it can be done easily. Adding lemon juice at the end makes sure the iron from spinach is absorbed by the body. So make sure to add it. You will need basic spices, onion, tomato, ginger and garlic apart from these main ingredients. On our recent trip to Amritsar, we made sure to dine at Kesar da Dhaba which is a mecca for good Punjabi vegetarian food. While the menu is quite decent, we ordered the absolute fav from this dhaba and that was their Dal Makhani and Palak Paneer. The main difference that I found in between my recipe and their’s is the amount of fat used. The ghee was floating on top of their Palak Paneer which definitely added to the taste. So if you making this recipe for any special occasion, go easy on ghee. You can replace the oil in the below mentioned recipe with ghee too and increase it’s amount. Secondly, they had also added more spices including coriander powder in this dish. Try to bump the amount of spices too if you are fond of spicy food. And lastly, a second tempering of ghee with cumin seeds is poured on top of the bowl filled with palak paneer. How to blanch the palak perfectly for making Palak Paneer? The main ingredients while making Palak Paneer is the Palak or Spinach and it’s very important to handle it properly. To blanch the palak, heat water in a large pot. Once it comes to a boil, add a pinch of baking soda to it. Add the thoroughly washed palak and let it cook for 2-3 minutes. Addition of baking soda retails the bright green colour of the palak making the resulting curry vibrant and green. You can also add a pinch of sugar in the water for a nice green colour. Once the spinach cook for 2-3 minutes, drain the water an immediately pour ice cold water over the spinach. It will cease the cooking process and make the spinach brighter in colour. Now you can go ahead and puree the spinach. The spinach is already cooked now and you don’t have to cook it too much while making the curry. 2. Clean the spinach and wash it thoroughly under running water. Once the water comes to a boil, add the cooking soda and spinach and blanch the spinach for 3-4 minutes. 3. Drain the water and run the spinach under cold water immediately. Put the spinach a blender along with green chillies and make a smooth paste. 4. Heat oil in a pan. Once the oil is hot, add cumin seeds and dried red chillies. Let them crackle for a few seconds. 5. Add onion and garlic and fry until onion turns translucent. 6. Add tomato and cook for 3-4 minutes. You can blend the masala at this stage for a creamier gravy. 7. Add coriander powder, garam masala powder and fry for another minute. 9. Add paneer, salt and 1/2 cup water and bring the curry to a boil. 10. Switch off the heat and add lemon juice and mix well. 11. For the Dhungar, heat a coal piece until it is red hot. 12. Keep a bowl inside the bowl with curry and keep the piece of coal on top of it. Pour a tsp of ghee on top of the coal and immediately close the lid of the main bowl. Let it rest for 10-15 minutes. Open the lid, remove the coal piece and the small bowl and give the curry a gentle mix. Garnish the Palak Paneer with Fresh Cream. Serve hot with Naan or Phulke. Palak Paneer is a quintessential Indian dish, a favorite across the length and breadth of India. 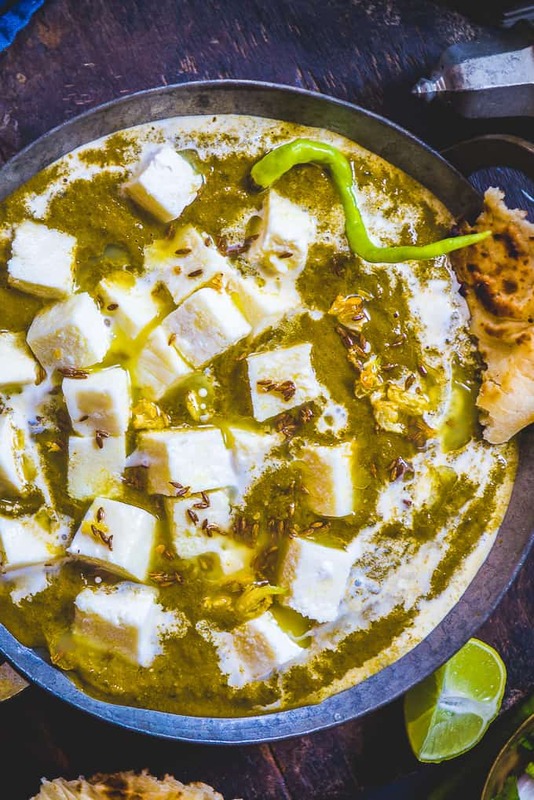 Here is How to make Palak Paneer recipe.Palak Paneer is a quintessential Indian dish, a favorite across the length and breadth of India. Clean the spinach and wash it thoroughly under running water. Once the water comes to a boil, add the cooking soda and spinach and blanch the spinach for 3-4 minutes. Drain the water and run the spinach under cold water immediately. Put the spinach a blender along with green chillies and make a smooth paste. Once the oil is hot, add cumin seeds and dried red chillies. Add onion and garlic and fry until onion turns translucent. Add tomato and cook for 3-4 minutes. You can blend the masala in a blender at this stage for a creamier gravy. Now add coriander powder, garam masala powder and fry for another minute. Add spinach puree and saute on high heat for minute. Add paneer, salt and 1/2 cup water and bring the curry to a boil. Switch off the heat and add lemon juice and mix well. For the Dhungar, heat a coal piece until it is red hot. Keep a bowl inside the bowl with curry and keep the piece of coal on top of it. Pour a tsp of ghee on top of the coal and immediately close the lid of the main bowl. Open the lid, remove the coal piece and the small bowl and give the curry a gentle mix. Garnish the Palak Paneer with Fresh Cream. Serve hot with Naan or Phulke. You can give a tempering of cumin and garlic in ghee once the dish is served in the serving bowl. This is sooo good . My husband loved it .Actually we are vegan . So just changed paneer to tofu and cream to vegan curd . Thank you so much for sharing it..! This dish was AMAZING!! SO easy, full of flavour and absolutely delicious. We had it with rice and homemade naan bread! This was delicious. I tried the recipe at home and loved it. I used homemade fresh cream and homemade paneer for this recipe and it was amazing. Thank you.